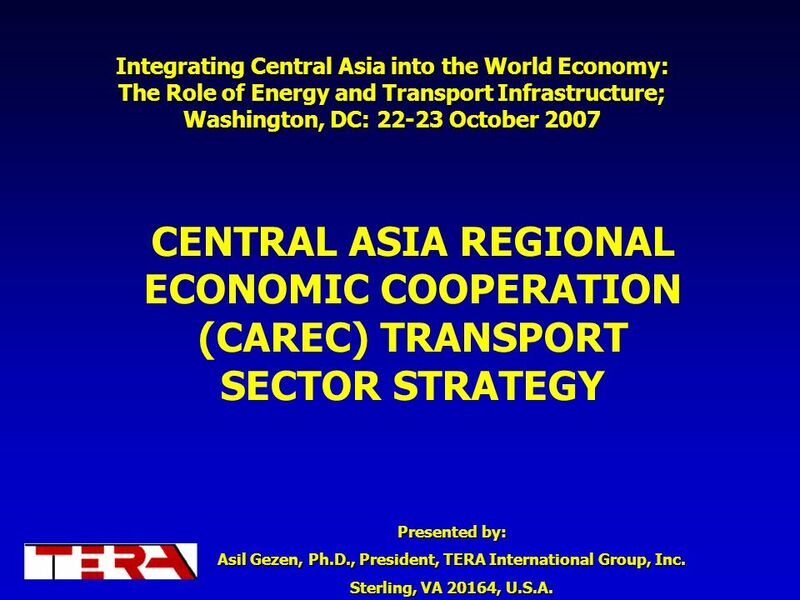 The Role of Energy and Transport Infrastructure; Washington, DC: October 2007 CENTRAL ASIA REGIONAL ECONOMIC COOPERATION (CAREC) TRANSPORT SECTOR STRATEGY Introductory salutations……… In my presentation today, I will provide an overview of the CAREC Transport Sector Strategy (TSS) prepared by the CAREC Secretariat for consideration and endorsement by the Ministerial Conference (MC). The Draft Strategy was extensively discussed in the TSS Second Regional Consultation Workshop held in Manila on 3-5 July Following comments received, the CAREC Secretariat presented the revised draft TSS to the Transport Sector Coordinating Committee Consultation Meeting held in Manila on 6 September 2007 and the Senior Officials’ Meeting held again in Manila on 8-9 September The TSS before the MC today reflects the latest version based on discussions held in these meetings and subsequent meetings with selected CAREC members. The CAREC TSS supports our long-term vision of “good neighbors, good partners, and good prospects through competitive regional transport”. TSS encourages good neighbors and good partners to respond to the common challenges and opportunities for mutual prosperity. 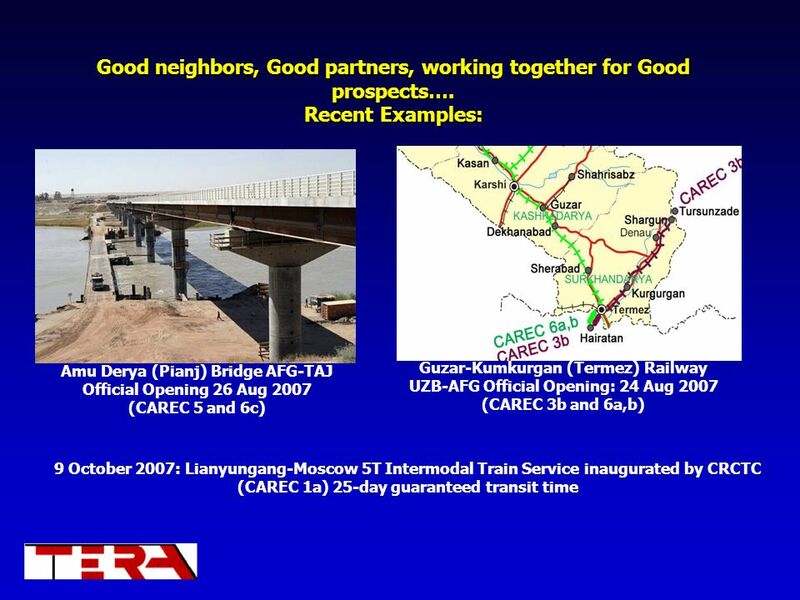 For successful implementation, the policy reforms and projects in the transport sector requires strong partnership and cooperation among CAREC member nations and development partners . Presented by: Asil Gezen, Ph.D., President, TERA International Group, Inc. Sterling, VA 20164, U.S.A.
2 …through competitive regional transport. Main purpose: to promote economic development through cooperation, and thus accelerate economic growth and reduce poverty. 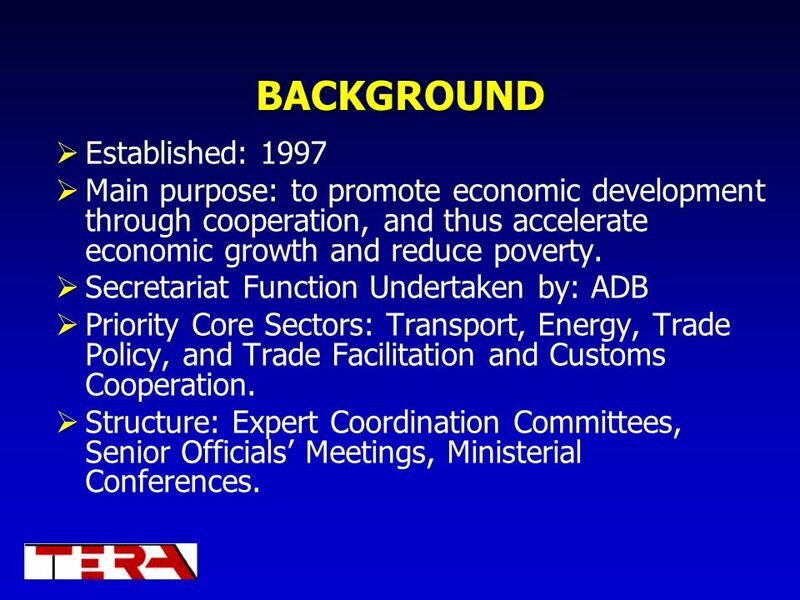 Secretariat Function Undertaken by: ADB Priority Core Sectors: Transport, Energy, Trade Policy, and Trade Facilitation and Customs Cooperation. Structure: Expert Coordination Committees, Senior Officials’ Meetings, Ministerial Conferences. 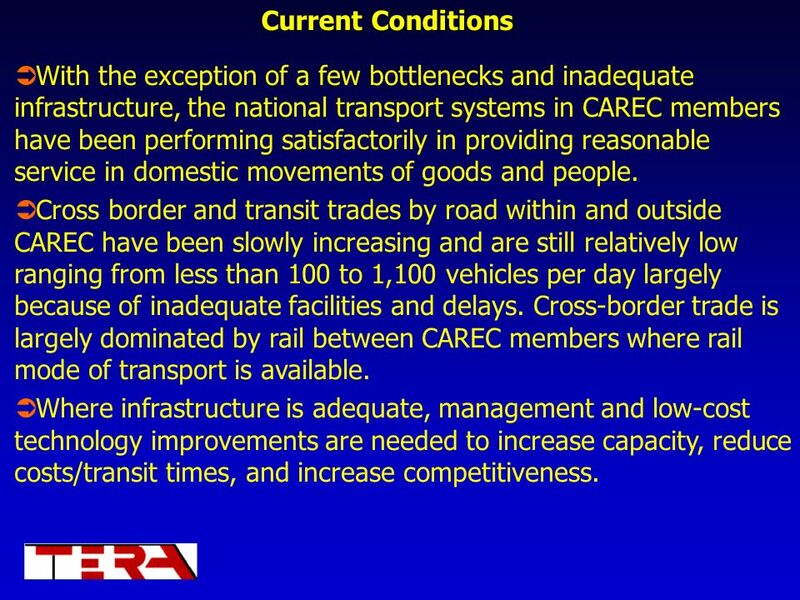 5 Current Conditions With the exception of a few bottlenecks and inadequate infrastructure, the national transport systems in CAREC members have been performing satisfactorily in providing reasonable service in domestic movements of goods and people. 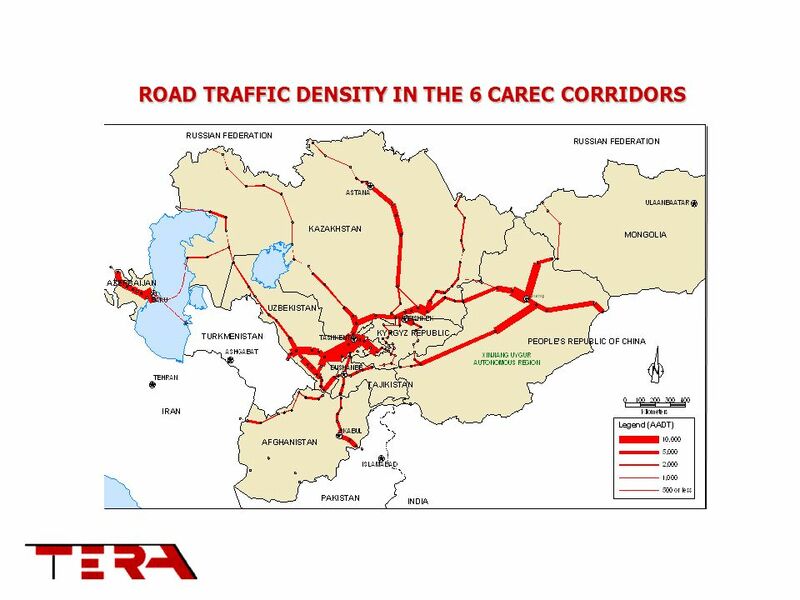 Cross border and transit trades by road within and outside CAREC have been slowly increasing and are still relatively low ranging from less than 100 to 1,100 vehicles per day largely because of inadequate facilities and delays. 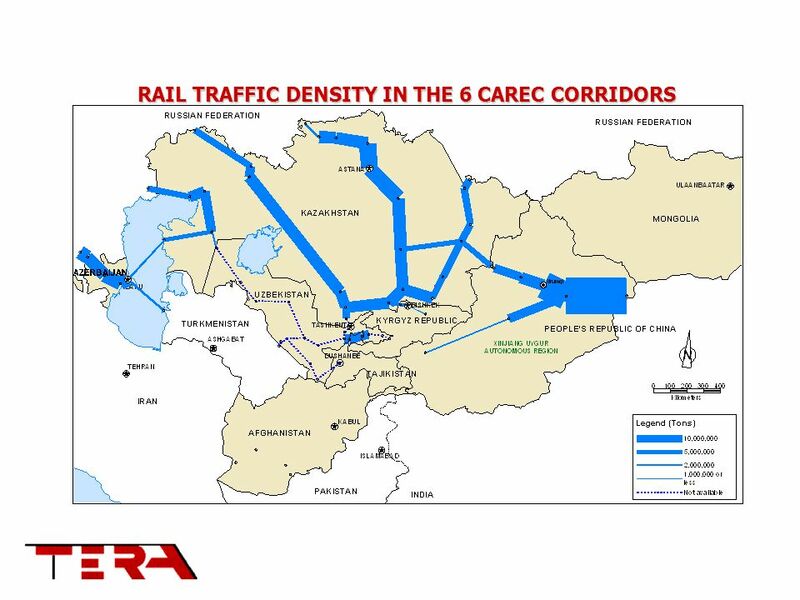 Cross-border trade is largely dominated by rail between CAREC members where rail mode of transport is available. Where infrastructure is adequate, management and low-cost technology improvements are needed to increase capacity, reduce costs/transit times, and increase competitiveness. 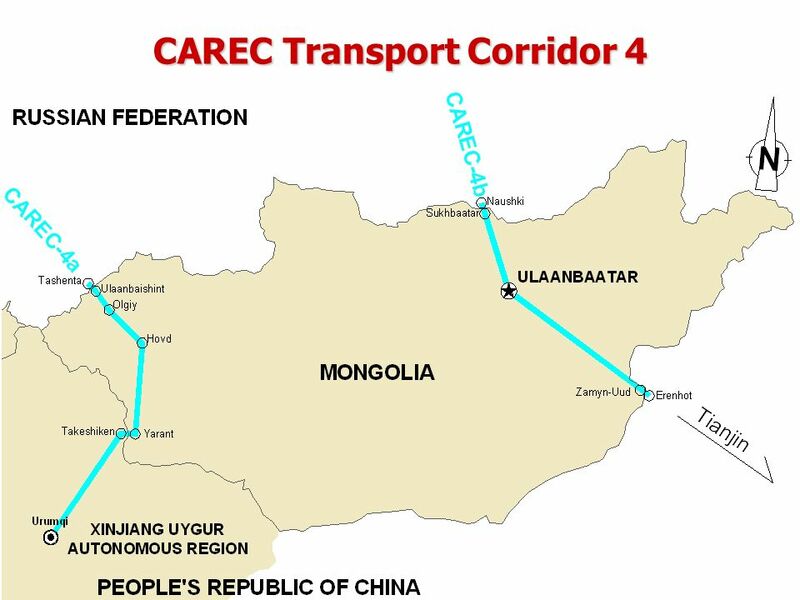 Without going into a detailed discussion of what we already know, I just want to emphasize three important salient features of the existing transport systems in CAREC. In general it performs satisfactorily in serving national needs, except in areas where there is congestion particularly in and around large urban areas, and some sections where infrastructure is inadequate or not passable. Road transport in regional and transit trades is still in its infancy. Due to the physical condition of border facilities and other impediments, cross border road traffic is low. Most freight is shipped by rail across borders if this mode of transport is available. In places such as Irkeshtam, Torugart, Torkham, Khorgos, Kara Suu, Hairatan, Islam Qala, etc. where rail service is not available road is the only mode of transport. Not only infrastructure but also management and low-cost technology improvements are needed for efficient and cost-effective performance of the transport sector. I will elaborate on this shortly. 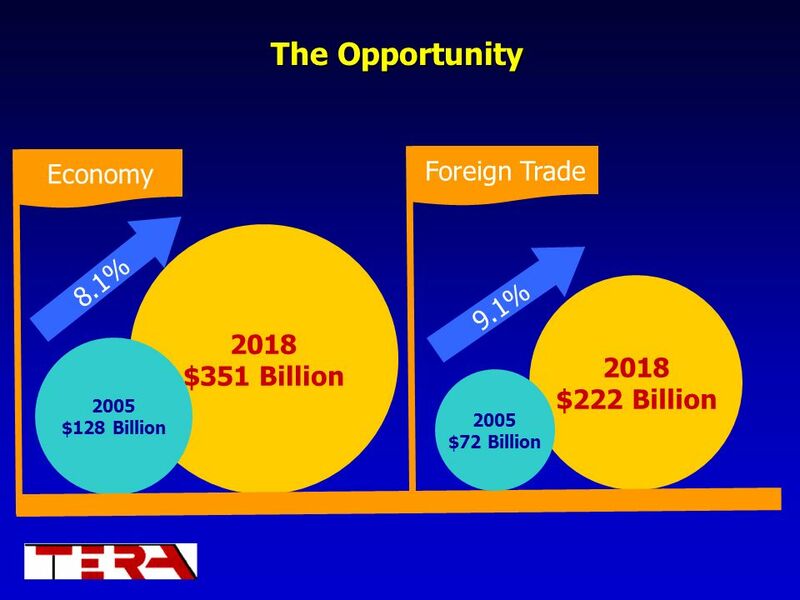 2005 $128 Billion 2005 $72 Billion Most analysts forecast substantial growth in GDP for the CAREC countries. On an annual basis, the GDP growth rate from 2005 to 2018 is expected at around 8.1% (from $128 billion in 2005 to $351 billion in 2018) as illustrated in this chart. There will be some variation with oil exporting countries and Xinjiang Uygur Autonomous Region (XUAR) growing faster than the others. This projection is based on continued progress in economic reforms on an accelerated basis. On the other hand, in recent years, total trade in goods (exports and imports) has grown at phenomenal rates especially in value terms. This chart is based on trends over the longer term ( ) as well as projections made by consultants. A rate of growth in trade approaching more than 9% per annum appears likely in the period to Intraregional trade within CAREC should grow more than external trade based on increased regional cooperation in trade and transport. More importantly, transit trade will also grow. 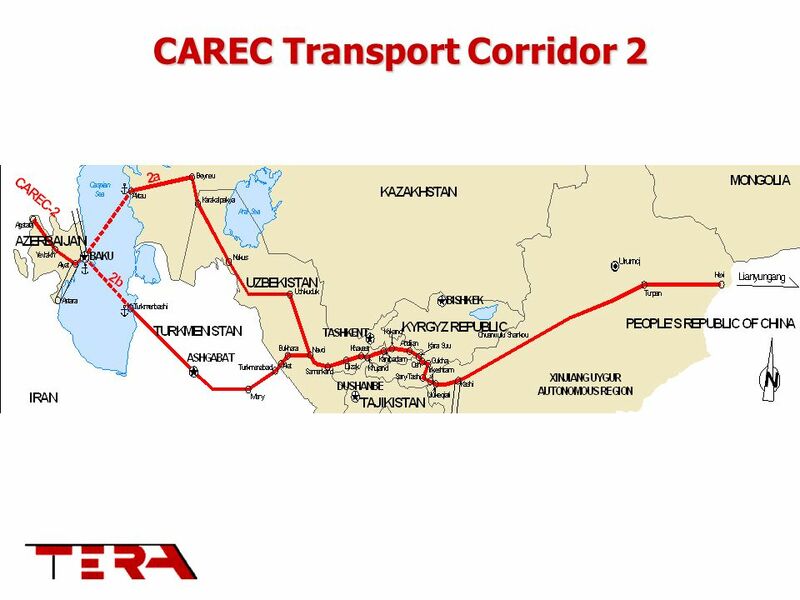 The CAREC region’s ability to capture this trade will be determined by how well we enhance corridor performance to facilitate trade and transport. In this age of globalization, competitiveness is one of the primary conditions for sustained economic development. A non-competitive product or service will not be able to serve the market’s needs and will disappear: it will be substituted by a more competitive product or service. This simple economic fact is also true for transport corridors whether national or international. A non-competitive international corridor which can not support the needs of the global marketplace will remain underutilized. Aside negative consequences to the corridor’s viability, under-utilization will stifle economic development in the corridor’s impact area and cause adverse effects on national and regional economies. 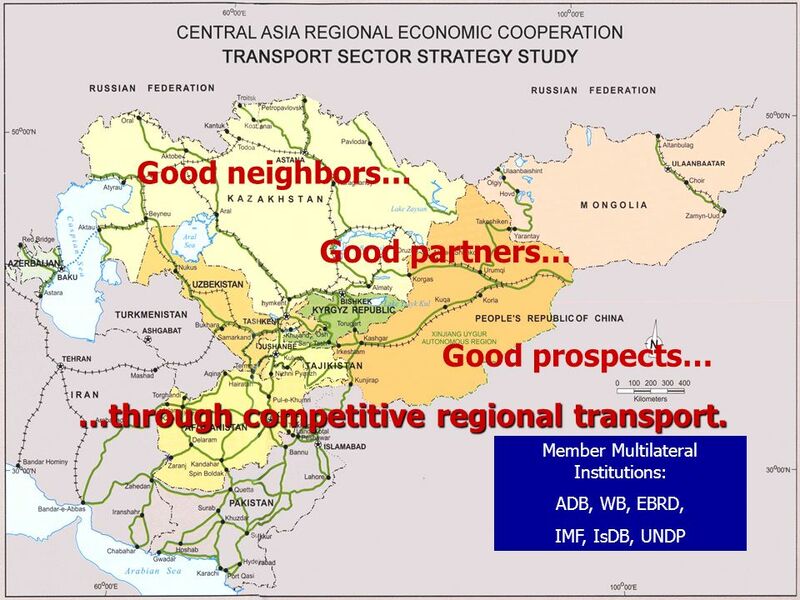 This is the challenge to meet: How do we enhance the CAREC corridor performance so that the economic development potential of the region is not stifled by non-competitive inefficient transport but supported by its competitive performance? In a 3-dimensional space, the most sturdy object is a 3-legged stool with legs of equal length. 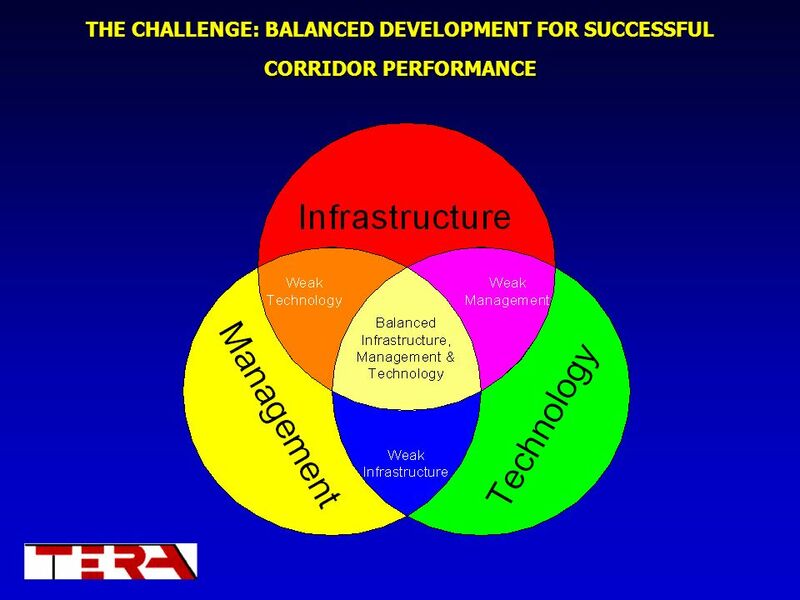 In the TSS we are using the same analogy with balanced emphasis on the 3 pillars for successful performance of CAREC corridors: Infrastructure, Management and Technology. I would like to underline the word “balanced”. 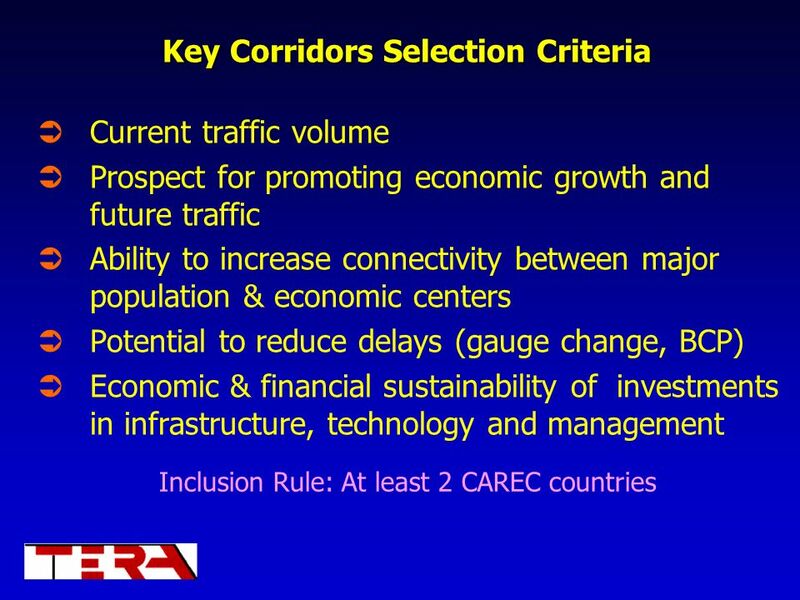 Lack of emphasis in any of these three pillars will result in a weakness in the corridor’s ability to meet the needs of its market; lack of emphasis in any two would definitely stifle development; and the absence of all three would mean “no corridor” at all, in other words no access and no mobility. Let’s turn our attention to the three pillars. 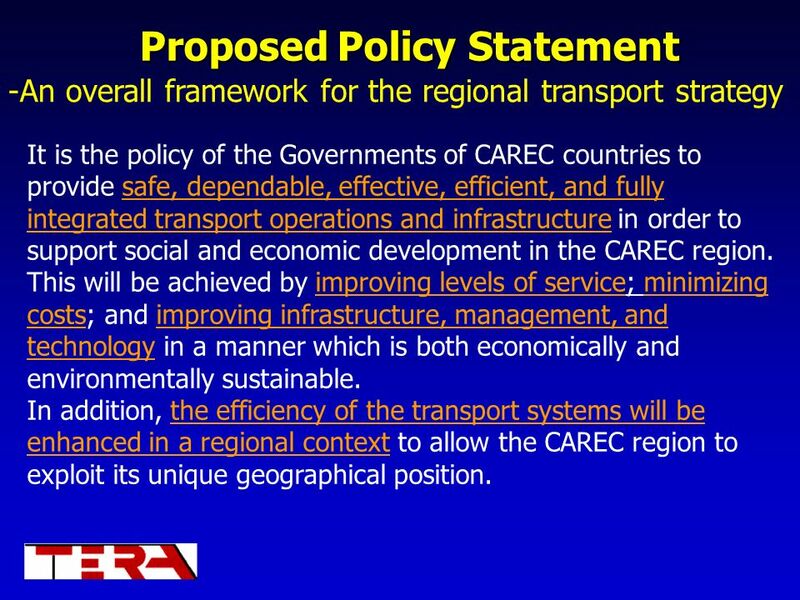 An overall framework for the regional transport strategy It is the policy of the Governments of CAREC countries to provide safe, dependable, effective, efficient, and fully integrated transport operations and infrastructure in order to support social and economic development in the CAREC region. This will be achieved by improving levels of service; minimizing costs; and improving infrastructure, management, and technology in a manner which is both economically and environmentally sustainable. 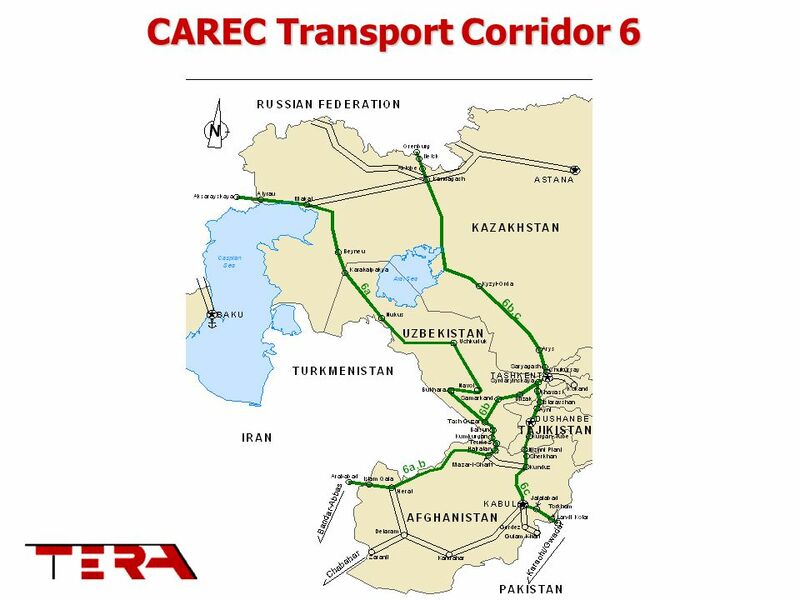 In addition, the efficiency of the transport systems will be enhanced in a regional context to allow the CAREC region to exploit its unique geographical position. 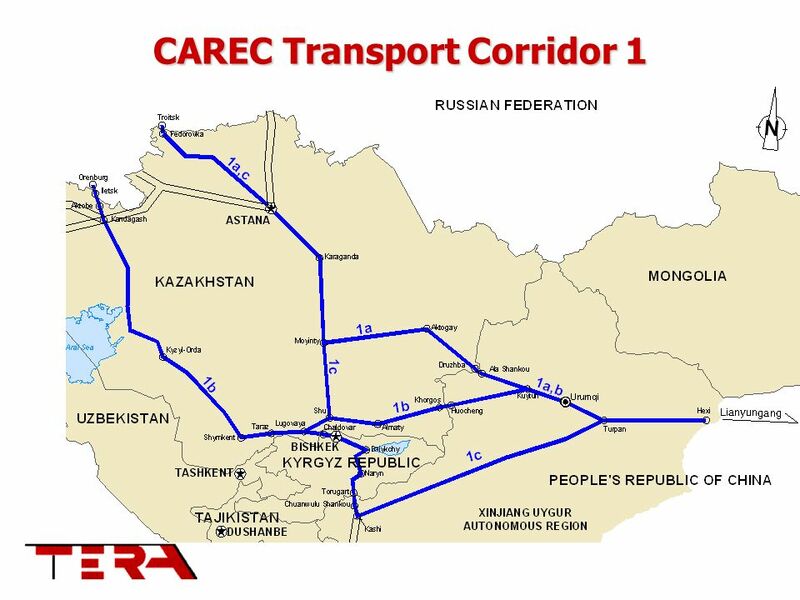 The CAREC transport sector strategy underpins the overall CAREC vision of “Good Neighbors, Good Partners, God Prospects” by reinforcing the three pillars (infrastructure-management-technology) that characterize the challenges and opportunities faced by the sector. The policy statement shown in this slide provides an overall framework for the regional transport strategy. It emphasizes the following principles: Transport operations and infrastructure must be focused on supporting social and economic development; Transport operations and infrastructure must be safe, dependable, effective, efficient, and fully integrated; To achieve the above will be possible by improving levels of service, minimizing costs, and improving infrastructure, management, and technology in an economic and environmentally sustainable manner; Efficiency of transport systems will be enhanced in a regional context. Only this way we will be able capture the benefits of the region’s unique geographic position; In developing and implementing the TSS we will emphasize moving people and goods. 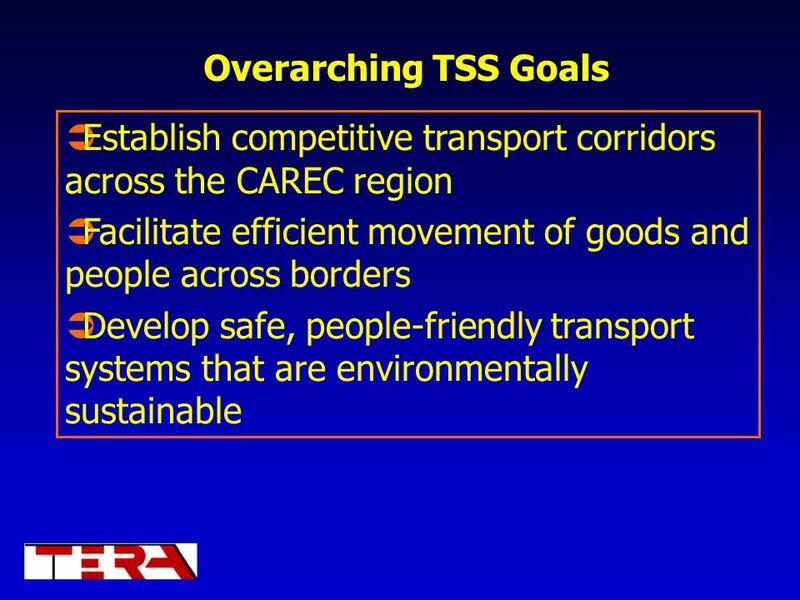 Overarching TSS Goals Establish competitive transport corridors across the CAREC region Facilitate efficient movement of goods and people across borders Develop safe, people-friendly transport systems that are environmentally sustainable The strategy has three overarching goals: To establish competitive transport corridors across the CAREC region; To facilitate efficient movement of people and goods across borders; and To develop safe, people-friendly transport systems. Competitiveness here is the key point. 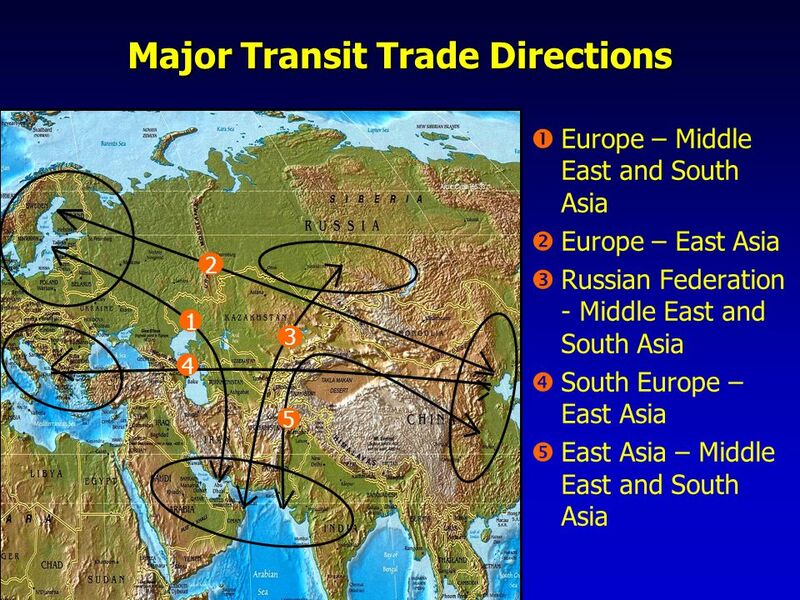 Transit corridors are already competing on the huge and valuable Eurasian trade. Most of that trade goes now by sea. For the landbridge, the Trans-Siberian Railway (TSR) is carrying most of the land traffic (either through Siberia or from Vostochny). The Trans China Railway (TCR) has tried to increase its share of the Eurasian traffic. The situation is quite fluid on the container traffic where volume can fluctuate easily between TSR and TCR depending on their respective pricing policies. In principle, it has been established that the corridors through Central Asia have the capability to compete with sea routes in terms of time and cost for some designated destinations in Europe (as illustrated by cost-time-distance case studies). However the key factor to guarantee for shippers is an increase in service reliability. The overarching goal is competitive and reliable transport service across borders in a safe, people-friendly, and environmentally sustainable manner. 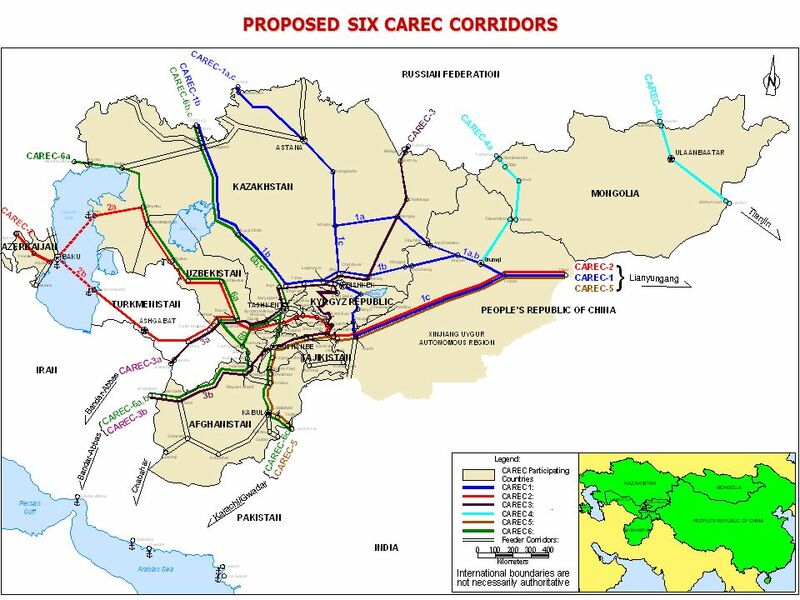 This map shows the six CAREC corridors that are needed to comprehensively satisfy CAREC’s international transport needs. 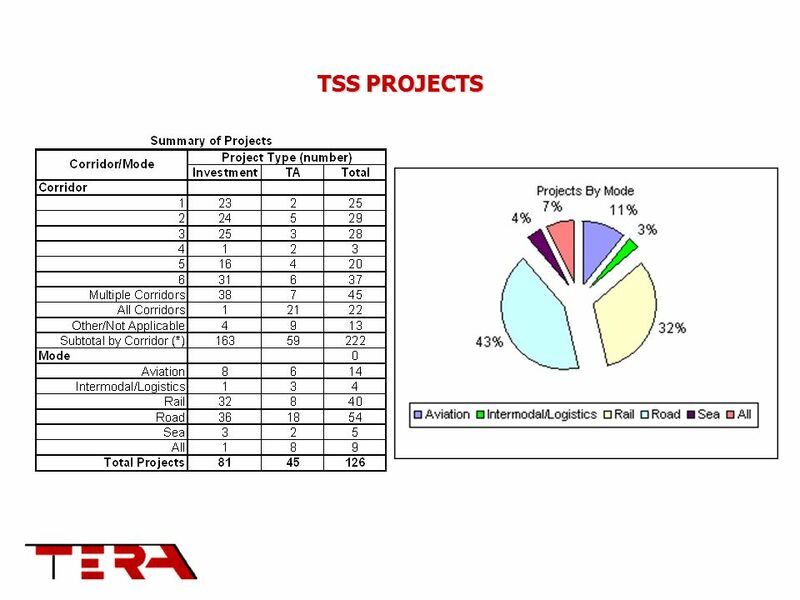 More detailed maps are included in the TSS Executive Summary Report. 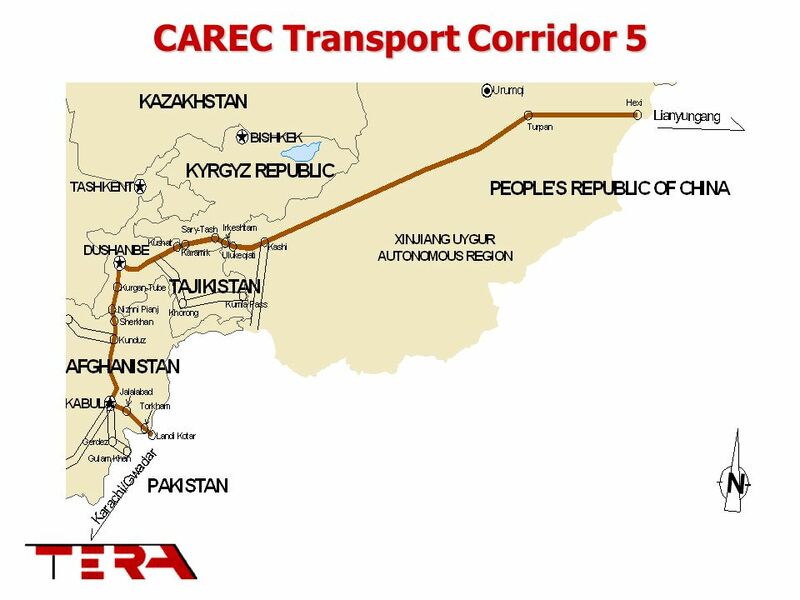 The six corridors may not satisfy every single one of the region’s cross border traders and travelers, but if fully functional to international standards, CAREC would be able to fully compete with competing corridors in global trade. Some corridors are already very active transit corridors others have the potential to become very active. The identification of the six corridors was made on the basis of global trade directions along the east-west and north-south axes. All corridors link two of the four large trading regions: Europe, East Asia, South and Western Siberia, and Middle East and South Asia. Some corridors have multiple alternative routes at intermediate locations (for example Corridor 1 has 3 alternative routes designated as 1a, 1b, and 1c). Also maximum routing flexibility is provided by use of multiple corridors at junction points. For example, freight moving from Aktau along Corridor 2a can reach Kabul or points in Pakistan through interchange at Khavast. 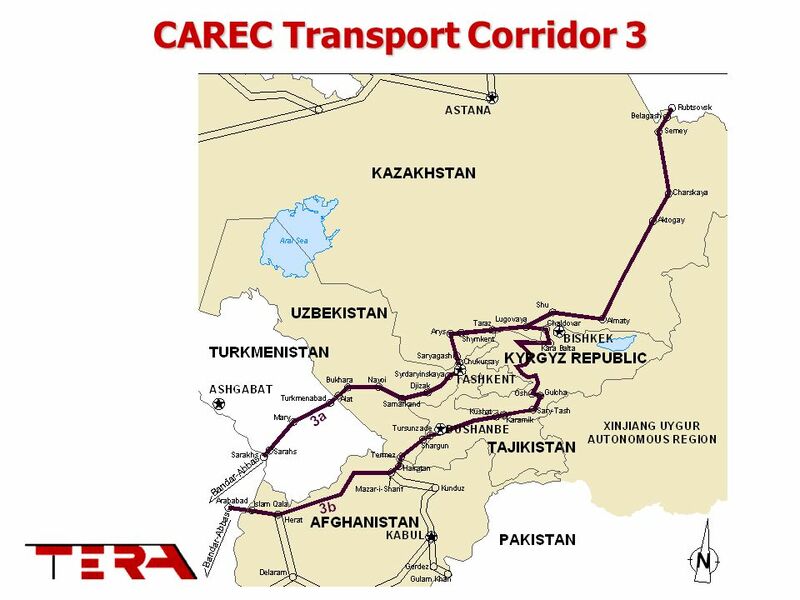 21 TSS PROJECTS The details of the draft CAREC Transport Sector Strategy including the corridor maps are presented in the TSS Executive Summary. 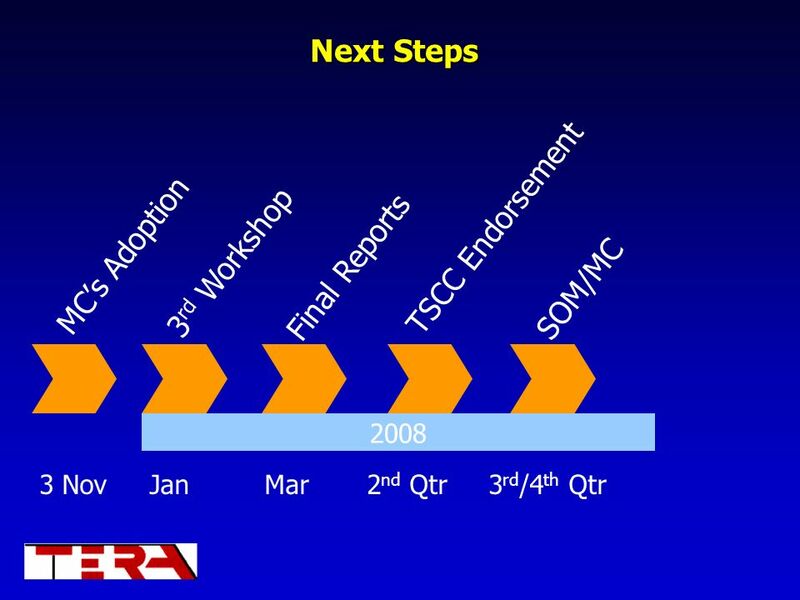 For the ten-year CAREC TSS from 2008 to 2018, some 81 Investment projects totaling $18.7 billion and 45 Technical Assistance projects totaling $50.1 million have been identified based on the Action Plan endorsed in the Urumqi MC in October 2006 and additional projects delineated in consultation with CAREC members. This is a preliminary list subject to modification. Most projects are for road (54 in total) ad rail (40). There are, however, 14 airport and civil aviation projects, 5 sea port and maritime projects, 4 intermodal/logistics projects, and 9 projects covering all modes of transport. Investment projects are those that governments have already decided to implement and included in investment plans. Technical assistance projects may take the form of feasibility studies leading to investment, but such projects also include preliminary planning, technical knowledge transfer, and support for institutional capacity improvement or restructuring. Download ppt "Integrating Central Asia into the World Economy:"
WITH THE FINANCIAL SUPPORT OF THE EUROPEAN UNION Western Balkans Regional Competitiveness Initiative Ohrid, FYR Macedonia 26 May 2011 Presentation for. COMMISSION ECONOMIQUE POUR LAFRIQUE BUREAU SOUS-REGIONAL POUR LAFRIQUE CENTRALE Fifty years at the Africa development service Regional Dimension for Transit. UN-ESCAPs Contribution to Transit Transport of Landlocked and Transit Developing Countries Roundtable Regional Dimension for Transit Transport Cooperation. 1 Jacek Cukrowski Economic Development and Poverty Reduction Advisor, UNDP, Europe and the CIS Bratislava Regional Centre Aid for Trade (AfT) Needs Assessment. EuropeAid Political Economy at Work Brussels January 2011 Paolo Ciccarelli Infrastructure Unit (Transport) Directorate for Development and Cooperation. ENERGIA Advocacy Activities and the Rio+20 process ENERGIA Advocacy Activities and the Rio+20 process Gail Karlsson ENERGIA Senior Policy Advisor Bridging. US East Africa Workshop “Developing Sustainable Transportation Systems” Emerging Issues. ORGANIZATION OF THE BLACK SEA ECONOMIC COOPERATION 7 th IRU Euro-Asian Road Transport Conference, Ministerial Meeting and Co-ordination Meeting of International.